Yesterday I wrote about how we know Enceledus has liquid water by its cryovolcanoes. There are other ways we can tell if a moon has a water interior, but one of the more interesting methods is to look at a moon’s aurora. This approach was recently used to show that Jupiter’s moon Ganymede has more liquid water than Earth. You might have seen an aurora on Earth when there has been a rise in solar activity. On Earth, the aurora (or northern lights) are caused by charged particles emitted by solar flares that interact with Earth’s magnetic field. When a charge enters Earth’s magnetic field, the magnetic field causes the charge to spiral along the magnetic field. For this reason magnetic fields tend to trap charges along their field lines. The charges generally stay trapped unless they collide with each other (not likely in interstellar space) or interact with something else, such as our atmosphere. Where the particles strike our atmosphere depends upon the energy of the charged particles, and thus the activity level of the Sun. As the activity level of the Sun varies, the latitude at which aurora are most prominent can vary. Aurora have been observed on other planets, as well as moons such as Ganymede. The difference is that the aurora of Ganymede are driven by the interaction with Jupiter’s magnetic field rather than the Sun. The process is much the same as aurora on Earth, but the latitude at which they are observed depends upon fluctuations of Jupiter’s magnetic activity. 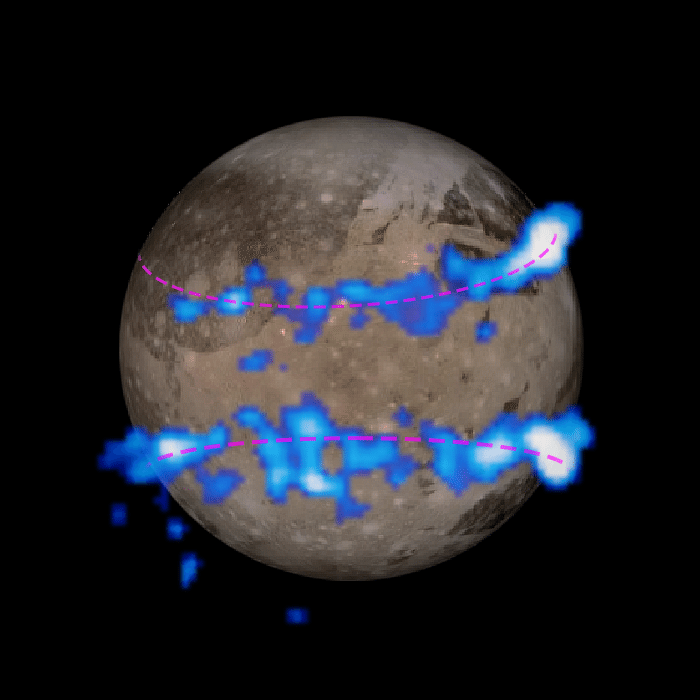 This has been known for a while, but in this new work the team demonstrated that the latitude variations of Ganymede’s aurora can be used to study the moon’s interior. Since Ganymede’s aurora are driven by the activity of Jupiter, the team could calculate the amount of variation one would expect given the strength of Ganymede’s magnetic field, giving a variation of about 6 degrees. However, the observed variation is only about two degrees. It would seem that something is dampening latitudinal oscillation of the aurora. One mechanism for this kind of dampening is an interior ocean of saline water. Salt water is a good conductor of electricity, so as Jupiter’s magnetic field varies, it induces a magnetic field in addition to Ganymede’s regular magnetic field. As a result, there are less latitudinal fluctuations in aurora. The team created a model of this interior ocean. They found that without an ocean there would be a fluctuation of about 6 degrees, but with an interior ocean the fluctuations are lessened. Given an observed fluctuation of about 2 degrees, the interior ocean would need to be about 100 kilometers thick, starting about 150 kilometers beneath the moon’s surface. That means Ganymede has about 70% more water than Earth. Paper: Saur, J., et al. (2015), The search for a subsurface ocean in Ganymede with Hubble Space Telescope observations of its auroral ovals, J. Geophys. Res. Space Physics, 120, doi:10.1002/2014JA020778.